A new law journal written, edited and published by undergraduate students at UCF is now available and will be distributed to law offices across Central Florida. “By establishing an undergraduate law journal, UCF joins a very elite group of universities that provides students this unique, unparalleled and quintessential experiential learning opportunity,” says Alisa Smith, chair of the Department of Legal Studies. Patricia “Trish” Cashman, a local attorney and longstanding member of the Department of Legal Studies Advisory Board, said the process of creating the journal provides a great educational benefit for the students and is a great way to educate and connect with the local community. 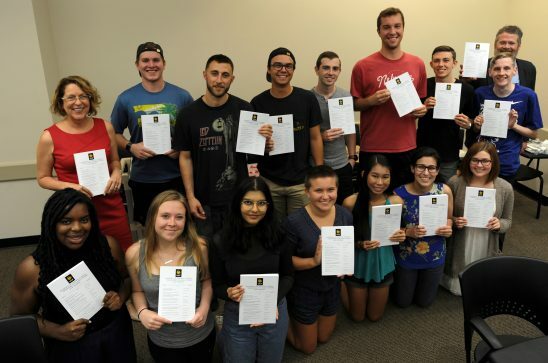 Legal studies professors recommended students for the editorial board during the fall semester, and UCF legal studies professor James Beckman, who served as the journal’s faculty advisor, selected the inaugural board, which comprised 15 students. As part of the journal’s board, students enrolled in a new legal-studies course focused on the best practices involved in preparing and editing an academic scholarly journal for publication in Spring 2018. The students also completed extensive research and reading in order to conduct multiple blind peer reviews typical for an academic journal and conducted extensive editing of the accepted articles prior to publication. The editorial board invited UCF students from any major to submit articles. By late January, the editorial board had received more than 50 in-depth and well-researched pieces covering a variety of topics for the journal. They chose 12 articles and a book review for publication. Topics in the 175-page journal include President Trump’s use of social media, the impact of race on the U.S. correctional system, and the legality of police officers’ use of automatic license plate scanners and whether such practices are privacy violations. Read the undergraduate law journal online.